Written by: Ricardo on September 30, 2013. It’s safe to assume that Judd Apatow has the market cornered on raunch-fest comedies with a gooey moral center. Since releasing The 40-Year-Old Virgin, Apatow’s actors have gone on to produce their own films, ranging from great (Superbad) to less-than-great (The Green Hornet). 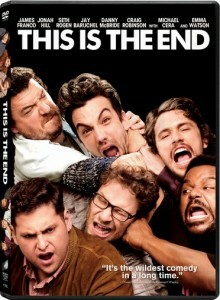 This Is the End , written and directed by Seth Rogen and Evan Goldberg, falls squarely in the middle of that spectrum. Like a comedy-version of Soderberg’s Ocean’s Eleven, the film succeeds on the chemistry of its cast, whose madcap performances liven up the mediocre material. 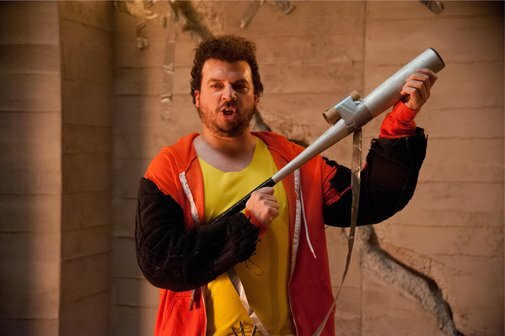 Based on the short film, Jay and Seth Versus the Apocalypse, This is the End finds Jay Baruchel visiting his old pal Seth Rogen in Los Angeles. Seth talks Jay into making an appearance at a celebrity-studded party hosted by multi-hyphenate renaissance man James Franco. When making a pit stop for cigarettes and candy, hell literally breaks loose and the duo retreat back to Franco’s house. There they find a small band of survivors, a group that includes Jonah Hill and the underrated Craig Robinson, but dwindling supplies and interpersonal tensions force the friends out of the house and into the apocalypse. As satire, Franco and Rogen’s performances play off the public’s perception of their work. Rogen’s Seth is every bit the weed-loving, genial slacker that audiences loved in Knocked Up, and Franco has fun embellishing his reputation as an eccentric space cadet. 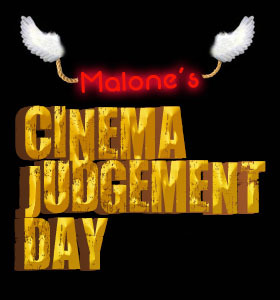 Danny McBride brings a foul-mouthed menace more ominous than anything the Rapture has to offer, while Jonah Hill surprises as a kind-hearted pollyanna seduced to the dark side. Craig Robinson proves adept at balancing levity and comedy. And Jay Baruchel, so good in She’s Out of My League, plays it straight. He succeeds, more often than not, at grounding the absurdity of the premise and turns out to be the perfect foil to all the comedic craziness around him. Rogen and Goldberg have crafted a thin, reference-heavy script. Everything from Rosemary’s Baby to Requiem for a Dream is lampooned, but the film shines most when the actors can bounce comedic gems off each other. Less successful is the duo’s attempt to inject some heart into the story. The theme of friendship worked wonders in Superbad, under Greg Mottola’s sensitive direction. It was even necessary in The Green Hornet to illustrate the change in Britt’s character. But here it’s just redundant. At this point, you’d think Rogen and Goldberg would have something else to say. For first time directors, the action is pretty coherent. There’s nothing particularly mind-blowing about the staging, save for a bevy of whip-pans during the initial devastation. Taken on the whole, however, it’s definitely a solid effort. Same goes for the CGI. The film’s climax features an interesting depiction of hell on Earth, or more specifically, Los Angeles. Where the directing duo falter is in their choice of on-the nose music cues. I’m pretty sure that, even in the delay between post-production and release, Gangham Style was still played out. And using Whitney Houston’s I Will Always Love You to hammer your theme of friendship home? It’s a little less than inspired. The crude use of pop songs can be forgiven, until Rogen and Goldberg decide to go all in and select a late 90′s pop staple to close out their film. It’s a cringe-worthy reach for humor that falls flat; something that rarely happens in the preceding 90 minutes. The DVD transfer of the film is acceptable. The blacks in the picture tend to fall off. It’s a bit an issue in a film with plenty of dark interiors. If you have the option, the Blu-ray version of the film might do more justice to the CGI-heavy final act. Standard 5.1 English Audio with English and French subtitles. Special Features include a Commentary with Rogen and Goldberg, the making-of featurette Directing Your Friends and This is the Marketing: a collection of promotional material and deleted scenes. Everyone knows Danny McBride (Danny McBride) is going to go to hell. Maybe it’ll be different in this movie. Overshadowed by orphaned Krytonians and adorable Minions, This Is the End still managed to eke out $100-million-plus at the box office this summer. If you weren’t among the initial crowd, This Is the End offers a clever mix of high and low comedy, and features enough laughs to compensate for its flaws. Simply put, This Is the End will leave you smiling when it’s over.